Travel in our comfortable 4WD to visit Flinders Chase National Park, take a stroll to observe Admirals Arch and Remarkable Rocks, look for koalas and wallabies, enjoy a gourmet BBQ lunch (optional) and have a nice cup of coffee watching the kangaroos at sunset at Grassdale Conservation Park … this is what you can do and much more! You will have an experienced tour guide all for your group (max 6 passengers) and with his/hers experience you will be able to observe the wildlife in their natural habitat and the beauties of Kangaroo Island. Travel in a comfortable and modern 4wd to visit Seal Bay, take a stroll to observe the Sea Lions sleeping on the beach, look for Koalas at Flinders Chase National Park and enjoy a gourmet BBQ lunch with KI wines (optional). After lunch, visit the Flinders Chase National Park, home of Admirals Arch and Remarkable Rocks and have a nice cup of coffee watching the Kangaroos at sunset at Grassdale Conservation Park. During the tour you will see a lot of wildlife including the elusive echidna. You will have an experienced tour guide all for your group (max 6 passengers) and with their experience you will be able to observe the wildlife in their natural habitat. Venture out with a local guide to experience a very different kind of “nightlife” – the sights and sounds of Kangaroo Island after dark. Travel in our comfortable 4WD to visit Seal Bay, take a stroll to observe the Sea lions sleeping on the beach, look for koalas and wallabies, enjoy a gourmet BBQ lunch (optional) and have a nice cup of coffee watching the kangaroos at sunset on the North Coast … this is what you can do and much more! You will have an experienced tour guide all for your group (max 6 passengers) and with their experience you will be able to observe the wildlife in their natural habitat. Travel in a comfortable 4wd to visit Seal Bay, take a stroll to observe the Sea Lions sleeping on the beach, look for koalas at Flinders Chase National Park and enjoy a gourmet BBQ lunch with Kangaroo Island wines (optional). After lunch, visit the Flinders Chase National Park, home of Admirals Arch and Remarkable Rocks and have a nice cup of coffee watching the kangaroos at sunset at Grassdale Conservation Park … this is what you can do and much more! During the tour will see a lot of wildlife including the elusive echidna. You will have an experienced tour guide all for your group (max 6 passengers) and with their experience you will be able to observe the wildlife in their natural habitat. 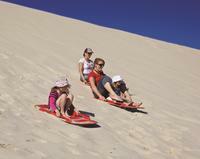 When visiting Kangaroo Island, try tobogganing on the sand dunes of Vivonne Bay. Your 2-hour toboggan rental includes access to the Little Sahara, a private park with sand dunes of different sizes — you get to decide which ones to tackle on this self-guided excursion. No prior experience is needed; you can even ride a toboggan with friends or children, making this an excellent option for families. The rental staff provides the toboggan, helpful tips and directions to the dunes, located just minutes away. When visiting Kangaroo Island, head to Vivonne Bay to try sandboarding, a sport like surfing, snowboarding or skateboarding but performed on sand dunes instead of water, snow or pavement. With your 2-hour rental, the staff provides the sandboard, wax, safety briefing and tips to get you started before you drive yourself to the nearby Little Sahara, an extensive collection of sand dunes perfect for beginning and experienced sandboarders alike. With prime access to the powdery dunes, enjoy two hours of downhill play. Explore an otherwise inaccessible part of Kangaroo Island on a guided ATV tour through open grassland, native bush and rocky terrain. Master the controls of your own bike as your group zooms past gorgeous scenery, the Southern Ocean, and Australian wildlife such as kangaroos, koalas and more. Whether you take the introductory option or the more challenging tracks, your expert guide ensures a safe, fun ride for all levels of experience (even kids are allowed to participate). Kayak down the Harriet River on a relaxing and leisurely half-day excursion on Kangaroo Island. All equipment and directions are provided by experienced staff before you set out on your own on the calm waters. Enjoy up to four hours to paddle and float along the tranquil river, enjoying the scenery and looking for wildlife such as fish, birds and maybe even a koala perched in a tree. It's the perfect kayak outing, whether you are going solo, with a friend or in a family group. Explore Kangaroo Island on a two-day small-group wildlife safari by 4WD. you'll see koalas, kangaroos and sea lions on Kangaroo Island, South Australia's wildlife haven, and discover the island's wilderness and coastal beauty. Enjoy personal attention from your guide on this two-day small-group tour, limited to 12 people, and travel to Kangaroo Island by round-trip ferry or upgrade to fly from Adelaide. Please note: Effective from May 3, 2018, due to roadworks on Frome Street, the temporary pick-up location for guests staying at the Majestic Roof Garden Hotel and Mantra on Frome will be 16, Hindmarsh Square, Adelaide. Make the most of a day trip to Kangaroo Island on a full-day guided tour that takes in the highlights of this unspoiled natural paradise. Visit Seal Bay Conservation Park, Vivonne Bay, Flinders Chase National Park, Remarkable Rocks and Admirals Arch among other spots to see native animals including koalas, kangaroos, wallabies, goannas, echidnas, long-nosed fur seals and more. Choose to travel by coach and ferry or by air to reach Kangaroo Island for a truly exceptional Australian wildlife experience. It's the best option for a comprehensive day trip to the island from Adelaide. Please note: Effective from May 3, 2018, due to roadworks on Frome Street, the temporary pick-up location for guests staying at the Majestic Roof Garden Hotel and Mantra on Frome will be 16, Hindmarsh Square, Adelaide. Explore Kangaroo Island on a fun 2-day tour that's perfect for travelers who enjoy an active adventure in the great outdoors. Get close to koalas, kangaroos and sea lions; visit pristine beaches at Stokes Bay and Flinders Chase National Park; and try out sandboarding in between coastal walks. You'll also visit a sheep farm and eucalyptus oil distillery, where you'll get to meet the friendly owners. Enjoy great amenities during your affordable overnight stay at Vivonne Bay Lodge. Small-group tour limited to 20 people ensures personalized attention from your expert guide. Please note: Effective from May 3, 2018, due to roadworks on Frome Street, the temporary pick-up location for guests staying at the Majestic Roof Garden Hotel and Mantra on Frome will be 16, Hindmarsh Square, Adelaide. This five-day, all inclusive tour from Adelaide combines two of South Australia's most pristine and iconic regions, each offering their own diverse experiences and landscapes. Spend two days exploring the pristine wilderness of Kangaroo Island then board a private charter flight from Kangaroo Island direct to Australia's Seafood Frontier – Port Lincoln. Here you'll be delighted by once in a lifetime wildlife and foodie experiences like swimming with sealions or shark cage diving with Great Whites. The scenery is diverse and spectacular and with your accommodation at two award winning properties, air charters, cruises and an incredible guide we promise you the trip of a lifetime. 2 Hour Swim nearby Dolphin / Seal & Coastal Snorkeling Safari departs from Christmas Cove Marina, Penneshaw. Have the opportunity to swim nearby wild dolphins or seals and snorkel some of KI's beautiful coastline. It's a great wildlife watching tour! We provide wetsuits, mask, towels, snorkel, and fins. Arrive at Christmas Cove Marina in Penneshaw 30 minutes prior to departure. You will be fitted into the appropriately sized wetsuit, mask, snorkel, and flippers as well as be provided with a safety brief. Then jump on board our 12 seater vessel in search of the marine life that inhabits the stunning coastline. Seals often become very active which provides a unique snorkeling experience. KI Ocean Safari is the only operator in South Australia that provides the opportunity to swim nearby the Long-Nosed Seals. Also, have the opportunity to swim alongside dolphins in the wild. The guide will also provide an informative commentary along the way. Travel to Kangaroo Island and sample a pristine nugget of the natural goldmine that is Australia. 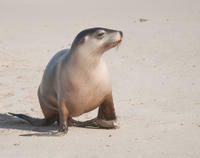 Check out a sea lion colony in Seal Bay, give sand boarding a shot in Little Sahara and perhaps head out on a walk in search of Vivonne Bay's wildlife. Spot koalas in Hanson Bay Wildlife Sanctuary, clamber about the bizarre natural sculptures of Remarkable Rocks and peer out at the ocean through the natural overhang of Admirals Arch. With plenty of activities on offer and abundant adorable wildlife, this two-day trip makes for a unique island getaway. Travel by 4WD on a small group tour with a local, knowledgeable guide. This 9-hour full day tour explores the rugged wilderness of Flinders Chase National Park which covers the entire western end of the Island. Break for morning tea en-route before exploring the dramatic Cape du Couedic. The iconic geology of Remarkable Rocks, Admirals Arch and the Casuarina Islets are all part of this remote south west cape. Lunch is a picnic featuring the best of local produce and some fine wines before entering through a locked gate into Grassdale – home to many kangaroos and some great farming heritage. Travel by 4WD on a 9-hour, small-group tour for no more than 12 guests with a knowledgeable local guide. Seek out kangaroos, koalas, wallabies, sea-lions a range of birdlife in their natural habitat. Enjoy a delicious morning tea amongst the Eucalyptus trees which are home to sleepy koalas. Travel through the center of the Island to the protected waters of the North Coast with its' white sandy beaches nestled between rocky headlands. Walk through the bush looking for kangaroos, wallabies and echidnas, or even the elusive glossy black cockatoo. Enjoy a seafood BBQ lunch at a private lunch-site in the bush before traveling to Seal Bay Conservation Park and take a private guided walk right into the Australian Sea-lion colony. Discover for yourself why Kangaroo Island is renowned for it's wines. Visit two of the island's vineyards, two of the island's gourmet food outlets, and the Kangaroo Island Spirits Distillery on this 8-hour tour. Kangaroo Island has plenty to offer everyone. Visit one of the island's vineyards, three of the island's popular gourmet food outlets and The Lavender Farm. Travel to Kangaroo Island for the day to take a small-group wildlife safari by 4WD. you'll see koalas, kangaroos and sea lions on Kangaroo Island, South Australia's wildlife haven, and discover the island's wild rugged beauty. Enjoy personal attention from your guide on this small-group tour, limited to 12 people, and travel to Kangaroo Island by round-trip ferry or upgrade to fly from Adelaide. Please note: Effective from May 3, 2018, due to roadworks on Frome Street, the temporary pick-up location for guests staying at the Majestic Roof Garden Hotel and Mantra on Frome will be 16, Hindmarsh Square, Adelaide. Take two days to discover the wildlife of Kangaroo Island from Adelaide. 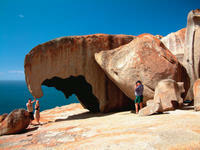 you'll see pelicans, sea lions, koalas and, of course, kangaroos, and experience the wild beauty of Kangaroo Island. you'll also visit several island attractions, including Seal Bay and Clifford's Honey Farm. Some meals are included, and you can choose to travel to Kangaroo Island by round-trip ferry, or upgrade to fly there or back from Adelaide. Please note: Effective from May 3, 2018, due to roadworks on Frome Street, the temporary pick-up location for guests staying at the Majestic Roof Garden Hotel and Mantra on Frome will be 16, Hindmarsh Square, Adelaide.